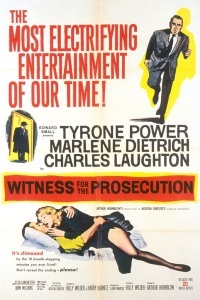 In this film based on Agatha Christie's short story and play, Leonard Vole (Tyrone Power) is accused of murdering an elderly rich woman, and the only alibi to him depends on his wife. One of my favorite movies and this is great timing for a rewatch! I believe this is the only Marlene Dietrich movie I've seen. I think it's still on Netflix. Haven't seen this, but there's a very good remake that was done by the BBC recently. Track it down if you can. I was astonished that an Agatha Christie story had such thematic and character depth because she's mostly just about the intellectual puzzle of the plot. Turns out, most of that material was added. But it really makes this a more compelling story than just a trick of legal procedure. I remember this as having excellent performances from Dietrich and Laughton that more than live up to the demands of the plot. I haven't watched it in years but maybe it's time for a re-watch; it certainly beats the pants off the majority of recent mystery movies. I believe this is the only Marlene Dietrich movie I've seen. If you can tolerate the absurdity of Charlton Heston playing a Mexican, Touch of Evil is otherwise an interesting film.